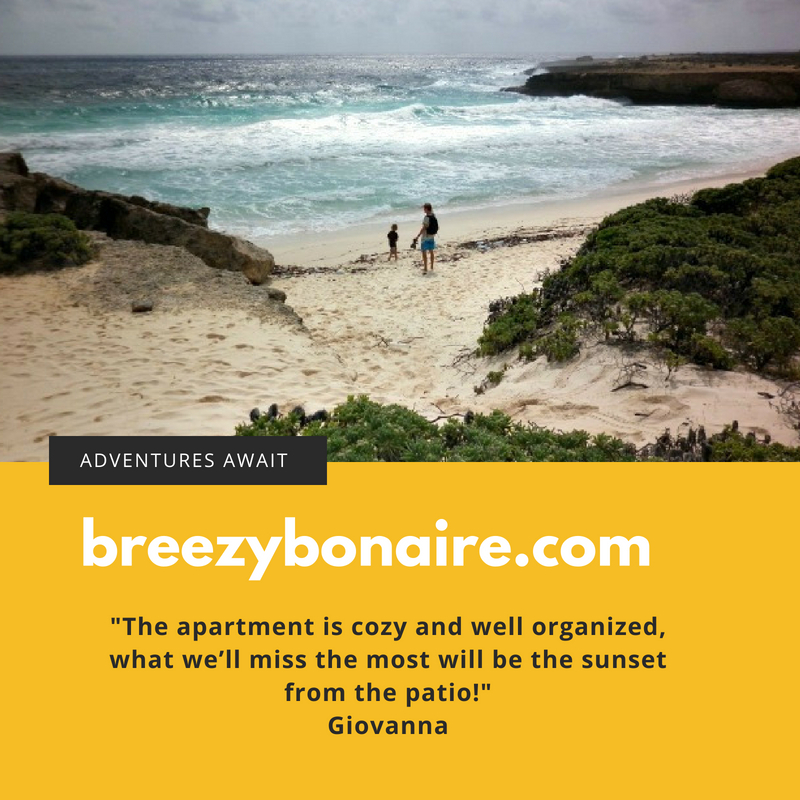 What: Climb during daylight and watch the sun set from the top of Mount Brandaris, the highest peak on Bonaire. When: Sunset, Sunday November 4 from 4pm to 7pm. A Hike to experience the sun set from Bonaire’s highest peak. Where: Be at the entrance to Washington Slagbaai National Park before 4pm. Why: This is a rare opportunity to be in the park after it closes and get to witness the sunset from Bonaire’s highest peak. Normal park hours have you at back at the main entrance by 4pm. For the hike you’re just getting started at 4pm. How much: Admission is $10 for everyone who has pre-registered for this hike. Who: The Sunset Hike Bonaire is presented by STINAPA Bonaire (the national park association of Bonaire). There is space for 20 participants. Call +599 717-8444 to reserve a spot. Registration is required for participation. Participants must arrange their own transport to and within the park. You will be back at the park entrance at 7pm. 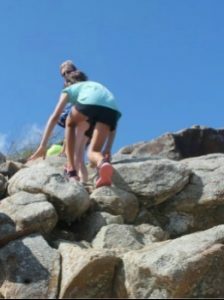 What else: This is an uphill climb on rocky terrain and some of it in the dark. You need to be in good shape and, have a light and have shoes appropriate for hiking. What to bring: Water, snack, flashlight, hiking shoes. Keep in mind that part of the descent will be after sundown so it’s important to have a working flashlight. Sunday lunch, or brunch at Lac Cai should not be missed if you are looking for real local food and a real local experience. Lac Cai is a nature reserve with a large mangrove forest, white sand beaches, a small scale restaurant/bar and beauty all around. If you are familiar with Sorobon Beach and Lac Bay, you may have noticed looking out to sea a couple small hills on the inlet. Those hills are made of conch shells which were discarded by conch fishermen when it was still legal to hunt conch on Bonaire. The hills of shells have been left as a reminder of those times. Lac Cai is definitely off-the-beaten-path. Although visible from Jibe City and Windsurf Place it can really only be accessed by a long, windy dirt road -or by windsurf board and sail! You will need a vehicle that can withstand the bumps to get you there along the long dirt road, but it will be worth it, especially if you go on a Sunday at lunch. You can go any day of the week to just relax in unspoiled surroundings but on Sundays there’s fresh local food and live local music. Bring everything you would need for a beach day – snorkel gear, rash guards, water, beach chairs, etc. And bring your appetite. Oh and cash. If it’s not a Sunday, don’t expect to find any services – although you may find the restaurant open other days. The Sunday Brunch, popular with locals and tourists alike, is only and exclusively on Sundays, year round, and only from around until the food runs out. Check google maps for Lac Cai and follow directions from there. Lac Cai is at the end of a long, windy, bumpy dirt road located off of Kaminda Sorobon. Pictured above is the fresh catch of the day with pumpkin, plantains and yucca -it was $11 in August 2018. And pictured below that are some fishing boats and kayaks at Lac Cai during the same Sunday Brunch in August 2018. Have a very lazy Sunday. 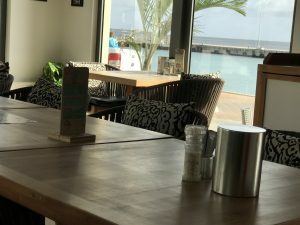 Where to go for Breakfast on Bonaire? Very few restaurants on Bonaire are directly ON the water. Karel’s Beach Bar is not just on the water, it’s ON the water! Karel’s is the dinghy stop for sailboats moored in the harbor in front of Kralendijk. They are open all day, serving breakfast, lunch and dinner. 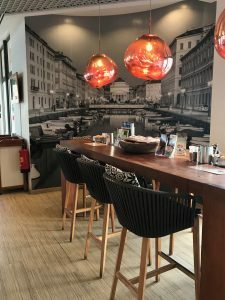 In fact at Breakfast time the restaurant is transformed into the “Cappuccino Bar.” in the afternoon it’s just Karel’s and in the evening it’s awesome for happy hour and can become very lively after dinner, sometimes with live music. When you come to the Caribbean it might just be for a few days and that during those few days your eyes are required to soak up some deep blue and turquoise. Personally that’s an important part of my Bonaire holiday. I can get dark water anywhere. I can get turquoise water here! Bonaire’s entire coast has a turquoise ring around it so you’ll get to take in a lot of blue during your stay. If you’re on the water at a restaurant like Karel’s you can’t miss the turquoise – but even being across the street detracts from your ability to soak up quite as many Caribbean colors. Added bonus – you can get up close and personal with the fish if you have a waterfront table at Karel’s. Some of the best restaurants on Bonaire, although close, are not directly on the water (At Sea, Capriccio, Mona Lisa, La Cantina, It Rains Fishes, Cuba Compagnie…) So if you want that “on the water” view – you may have to give up a little in terms of quality being slightly lower and price being slightly higher – but the view might just be worth it. That’s about how I’d sum up Karel’s Cappuccino Bar. The service is friendly, the food is OK, the coffee is fine but it would be basically impossible to beat the view. So, yes, I like the Illy coffee over at Luciano more and I like the cappuccino at Gio’s even better, but I am going to go to Karel’s now and again because there’s no other place where my eyes can soak up this much turquoise while I’m drinking my coffee. Karel’s has sunset views and great prices on drinks at happy hour. The water doesn’t look as turquoise at sunset though – and in the mornings it’s quiet – so that’s my favorite time to go to Karel’s. The list is pretty short. Of those we highly recommend Ingridients and Spice Beach for dinners and any of the restaurants on Lac Bay for lunch. A Taste of Bonaire is your chance to sample local food specialties, taste the signature dishes of your favorite Bonaire restaurants at reduced prices, check out some handicrafts and artwork, listen and dance to local music played live on stage and get a taste of not just Bonairian food but also Bonairian culture. 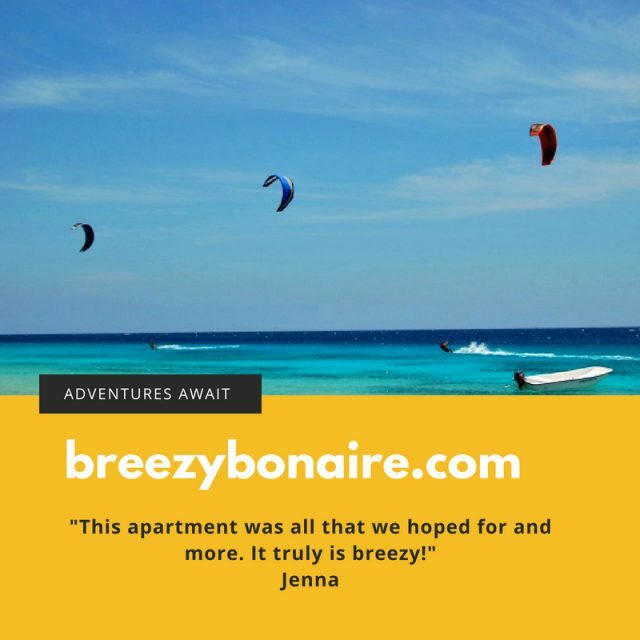 This is a fun place to people watch and also get a taste of what it’s like to live on Bonaire. Taste of Bonaire is a popular event with people living on Bonaire. Booths are set up in the park for vendors and tables and chairs for visitors. Food is served in disposable carry-out containers or paper plates. A band plays on the round concrete stage that is a fixture of Wilhelmina Park. Event organizers sometimes give short speeches. A Taste of Bonaire is a casual, social event that takes place approximately one time per month. Check the Taste of Bonaire Facebook page for upcoming dates. Right now the next Taste of Bonaire is scheduled for August 4th from 6-11pm and then September 2nd 6-11pm. The September 2nd Edition will be honoring Bonaire Flag Day and is the Dance Edition. What to bring: Cash and an open mind to try new flavors! STINAPA Bonaire is hosting a fun full moon walk in the Washington Slagbaai National Park next Friday. This event is open to anyone up for an adventurous hike under the full moon. The walk is along the Lagadishi trail which brings you to a limestone plateau with a vista over the island. Expect to see plenty of plants and animals including iguanas and flamingos as well as scenery such as blow holes, mangroves, beaches, sand dunes and a salt pan. Bring water, be ready for some adventure and watch out for cacti! STINAPA Bonaire stands for Stichting Nationale Parken Bonaire, a non-governmental, not for profit foundation commissioned by the island government to manage the two protected areas of Bonaire: the Bonaire National Marine Park meaning all waters surrounding Bonaire and Klein Bonaire as well as the Washington Slagbaai National Park which is the uninhabited land north and west of Rincon. Where: The Lagadishi Trail along the coast and back. What to bring: Comfortable walking shoes and a flashlight for looking at the ground beneath your feet for safety. Water bottle and snacks. How: Call 717-8444 to register. Space is limited to 25 participants. Cost is $10 per person. Meet at the entrance of Washington Slagbaai National Park. Get Scuba Certified: Children age 10 and up can already begin with either a one day “Discover SCUBA” course or junior open water certification courses. Ask your dive center for details. There’s a lot to be explored on Bonaire. Kids can go almost anywhere that adults can go. If your kids are adventurous and want to get up close and personal with donkeys, iguanas, flamingos, pelicans, the fish in the sea and most of all with the water, this is the island for you! Dunkerbeck Pro Center – the new windsurf school on Lac Bay. What’s it all about? 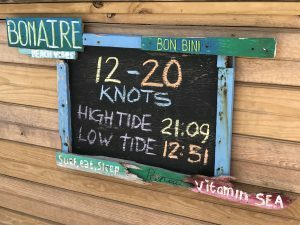 Sorobon Beach Resort, the only hotel on Lac Bay, is now home to a small scale windsurf school and rental shop. 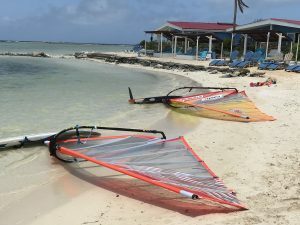 The other two windsurf shops on Bonaire are Jibe City and Bonaire Windsurf Place, which are direct competitors and next door neighbors. Dunkerbeck Pro Center was founded by Bjorn Dunkerbeck and Phillipe Bru, well known professional windsurfers who also founded the 1000+ racer DefiWind in France. 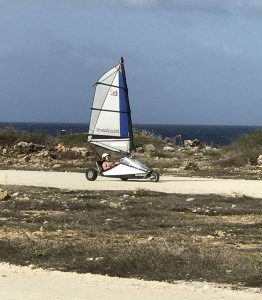 Two years ago they brought the DefiWind to Bonaire and less than one year ago they opened the Dunkerbeck Pro Center at Sorobon Beach Resort. The shop is next door to Jibe City and directly on Lac Bay with a large stretch of beach front. The Pro Center offers gear rental mainly for slalom sailors as well as windsurf lessons for all levels, beginner through professional. You can also rent foil boards and learn windsurf foil with the pros. On days when the wind isn’t blowing too hard, rent a stand up paddle board or SUP OR give wind foiling a try. Dunkerbeck Pro Center is set up mainly for guests of Sorobon Beach Resort but anyone can rent gear or take lessons from them. Their prices are already higher than Jibe City and Windsurf Place and for resort guests; add on an extra 20% if you aren’t a guest of Sorobon Beach Resort. The price is a disadvantage but the gear is new, the shop prides itself on quality equipment and service and they open a half hour earlier and close a half hour later than their only two competitors. The wind traditionally is strongest in morning and evening so the extra hour added on to the day at the best time of the day is going to be a deciding factor for serious windsurfers. Lessons at Dunkerbeck pro center make use of headsets and microphones so that the windsurf instructor can communicate directly with you while you are sailing. This is a big advantage to your windsurf instructor yelling directions to you in the wind and can make for a better learning experience. 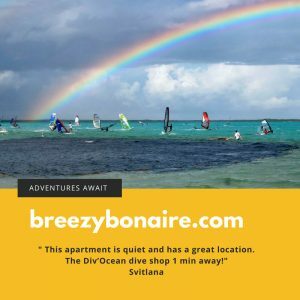 The following video has great drone footage of Phillipe Bru windsurfing on Bonaire and some great foiling shots. Foiling is becoming more and more popular all over the world and was almost completely unheard of just five years ago. It’s possible to plane on foil gear in lower winds than with a normal board. 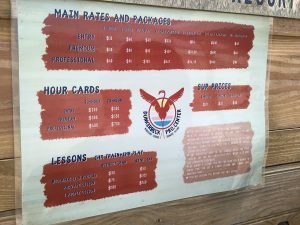 Foil lessons (wind foil lessons) offered at Dunkerbeck Pro Center offer a unique opportunity to learn and master this growing new area of the sport – wind foiling! As a precaution you can only use foil gear once the instructors are convinced that you know what you are doing! Lessons:$50 for beginner including gear, $105 for private lesson including gear rental, $150 for two person semi-private lesson including gear. Mamma Mia world premiere in Bonaire! July 18th under the stars. Watch the latest releases by the light of the moon and the stars. Bring your own chair or use the chairs provided by the movie theater. Who knew seeing a movie outdoors on Bonaire could be this much fun. Ice cold wine and beer along with popcorn, soft drinks and hot dogs are served. You can also order Thai food in advance and have dinner with your movie. The ADVANCE PREMIER OF Mamma Mia Here We Go Again! will be released this Wednesday at 7:30pm. Don’t miss it! 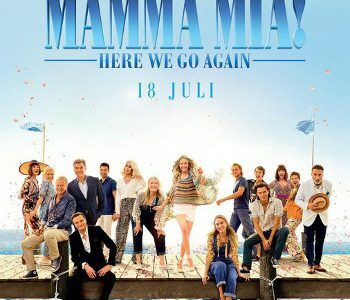 Here We Go Again is the sequel and also the prequel to the 2008 film Mamma Mia. It is scheduled to be released in North America and the UK on July 20, 2018. The release in July 2018 marks the 10 year anniversary of the original film released in July 2008. Stars include Meryl Streep, Colin Firth, Christine Baranski, Pierce Brosnan and Cher. Advance Premiere of Mamma Mia – Here We Go Again! Special price admission for only $5. Last chance to see this movie at Empire! Empire Cinema Bonaire – an outdoor movie theater. Have dinner there and watch the latest releases by the light of the stars and the moon. In 2015 Empire Cinema (figuratively) opened it’s doors and Bonaire finally had a movie theater! I say figuratively because Empire is an outdoor cinema – technically I don’t think they have doors. 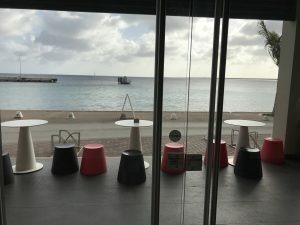 This is SUCH an unexpectedly awesome place to see a movie and fun way to spend a quiet evening during your Bonaire vacation. It’s popular with locals and tourists alike. 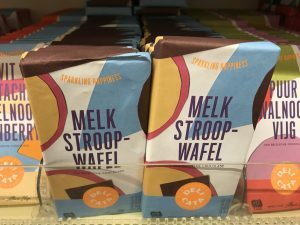 A little history: A movie theater located next to what is now Top Supermarket in downtown Kralendijk existed in the early 2000’s – but the dilapidated building closed down dye ti disrepair and lack of business sometime around 2007 or 2008. Islanders and tourists went without a movie theater for quite a few years. And these were the days before Netflix and decent internet connections! The Plaza Resort held outdoor movie nights under the stars which somewhat filled the void and made for a fun evening – but the sound and quality were unpredictable as were the movie choices and language of the films. Either the Plaza’s projector eventually broke or they just didn’t find it a useful part of their business so that too came to an end. Thus the opening of a reliable movie theater showing new films was a big deal for the island. Empire Cinema opened in 2015 and is going strong. They show first run movies in an outdoor setting under the stars. They even occasionally release films that haven’t yet premiered in the US or Europe. This is the only movie theater you may ever go to where you actually have to pick up and put away your own (plastic) beach chair! Maybe that doesn’t sound too comfortable. But go there because it is. This place is breezy, refreshing and a great way to spend a quiet evening. Get there early to claim your spot of choice. If going on a night when you expect a crowd it can’t hurt to have chairs packed in your car and ready in case they’re needed. It’s not super easy to find and not well marked from the road. Coming from Caribbean Court or the Plaza Resort Area, head north on the main road passing through downtown Kralendijk. Continue heading north until you pass the traffic circle at Kaya Amsterdam. A few hundred meters further on your right you will see MCB Bank and then Bon Bida Spa and Gym. Empire cinema is located just past MCB Bank on the right. Turn right into the Bon Bida parking lot just past MCB and continue straight along the dirt road. You will see the movie theater on your right just up the road maybe 100 meters. The exact address is Kaya Katwijk 6, in the area of the island called Hato. Ticket prices range from $5 when there’s a special to $12. Expect to pay $11/person for most films. Unexpectedly for Bonaire (where many things run on island time) the movies start right on time and there’s generally one preview and a couple simple billboard style ads on the screen. A movie that starts at 7:30 actually starts at 7:30, so be on time to Empire Theater and not on island time! 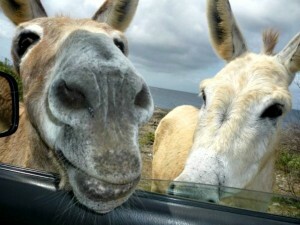 Bonaire is well loved by tourists that come back year after year. But a big concern for first time visitors planning a trip here is, “but what about beaches?” Bonaire is not known for white sandy beaches. Enter Klein Bonaire. On arrival on Bonaire as you fly into Flamingo International Airport, if you are sitting on the left side of the plane you should have a pretty clear view of Klein Bonaire. If you aren’t paying attention during your trip your view of Klein Bonaire from the airplane may be your only sighting of it. 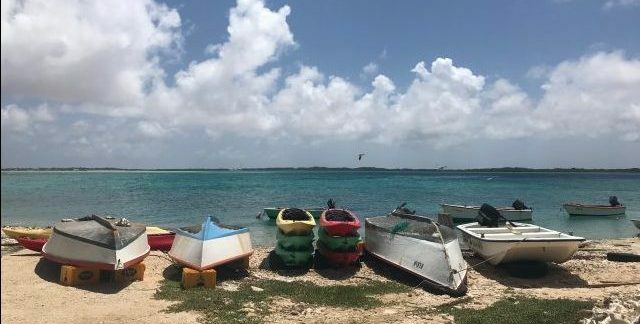 There’s so much to do on the “mainland.” But Klein Bonaire is worth it so don’t forget to plan a day trip. 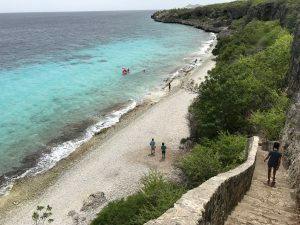 Klein Bonaire, the small uninhabited island off the coast of Bonaire in front of Kralendijk is nothing if not white sandy beaches! Actually it’s also quite a lot of coral reef and is surrounded by dozens of scuba dive sites and snorkeling sites. Amazingly this little island has a completely different look and feel than the larger main island of Bonaire even though it’s possible to swim between the two islands. In Dutch the word Klein means Little. So the name of this island literally translates as Little Bonaire. It is about half a mile from Bonaire at its closest point and is about 1500 acres in size. It’s made up of sandy beaches and thorny plants and trees. The only structures on the entire island are two huts at a beach named “No Name Beach,” which provide shade and shelter for anyone lounging around the beach for the day. Outside of the two small huts, Klein Bonaire is completely undeveloped and uninhabited. The island is owned by the Bonaire government. The Foundation for the Preservation of Klein Bonaire (FPKB), which started in the 1990’s during a fight against development of the small island is in large part to thank for the pristine, uninhabited island you find today. The waters surrounding Klein Bonaire are protected as part of the Bonaire National Marine Park, as are all waters surrounding Bonaire itself. 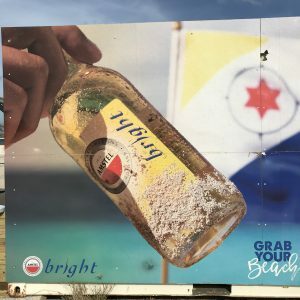 There is currently no discussion about development now or in the future of Klein Bonaire. Although Klein Bonaire has zero facilities, just natural beauty it simply cannot be missed. Klein Bonaire is one of the best places on the island and in the world to go snorkeling. If you are coming to Bonaire for snorkeling this is definitely on your list of must see snorkel stops. If you have never snorkeled before – this is a good time to begin! There are dozens of places to snorkel around Klein Bonaire and access is easy with the sandy bottom and clear, calm water. Your water taxi may be able to drop you off in a location to allow you to drift to the beach where you’ll be picked up later in the day. Inquire with your captain. The following video was filmed on Klein Bonaire at a few snorkel spots: No Name Beach, Jerry’s Reef, Ebo’s Reef, and the Sampler dive sites. 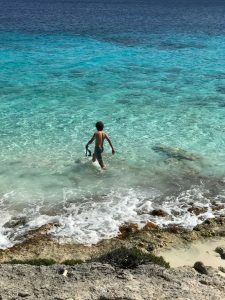 Each year in October the annual “Swim to Klein Bonaire,” takes place with the departure point at Eden Beach (Spice Beach) – which is about as close as you can get to Klein Bonaire from here. 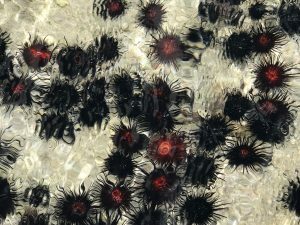 For day to day tourism, however, we don’t recommend swimming there! We recommend taking the water taxi. There are several to choose from. Departure points for the water taxis are at hotels on the waterfront in and North of Kralendijk, Karel’s Pier (in Downtown Kralendijk) and from in front of It Rains Fishes restaurant which is a few blocks north of downtown, along the waterfront promenade. Caribe Water Sports Water Taxi: phone +599 700-8080 Taxi’s depart Eden Beach at 10:30am, 12:30pm and 2:30pm and return to Eden Beach at 12:45, 2:45 and 5pm. Taxi’s also service Karel’s Pier. Inquire about departure times and price. Another idea: Klein Bonaire is home to turtle nesting grounds. 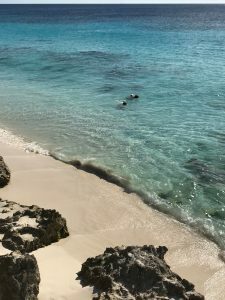 Sea Turtle Conservation Bonaire (STCB) offers small scale trips to Klein Bonaire during turtle nesting season (May – November) where you can watch experts monitor sea turtle nest activity and watch for tracks in the sand of newly hatched turtles. This program is very small and fills up quickly. This is a great alternative to just spending your Klein Bonaire day lounging on the beach. Call in advance to make reservations. One more: If you take a trip on theWoodwind Snorkel Sail you will do a drift snorkel near Klein Bonaire but you won’t actually get off the boat to set foot on this island. Enjoy the marine life with an amazing tour – but no chance to enjoy that white sand. And yet one more option for getting to Klein Bonaire: Rent a boat for the day. Try Caribe Water Sports – they rent boats, hire out captains, and also provide a water taxi service. 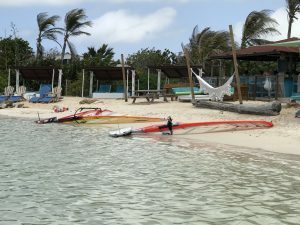 If you rent a boat you can moor at Klein Bonaire but you cannot pull the boat up on the sand the way the water taxi’s do. You have to jump out of the boat and swim to shore. If you rent a boat you may want to leave towels and cameras on board the boat. 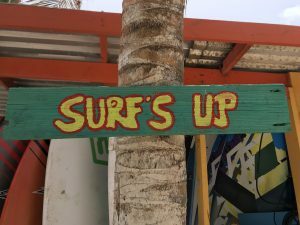 What to bring: rash guard; snorkel, mask and flippers; towels; plenty of water; a cooler for food/drinks if you want; a camera or go-pro; sun screen; a hat for shade; sunglasses; flip-flops and maybe even a fold up beach chair. Upon exiting the water taxi you will just walk through a few inches of water to get to the beach so you can carry dry items onshore. 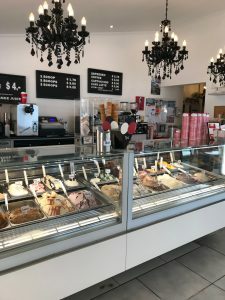 The competition is intense (at least in my mind…) between ice cream at Gio’s and ice cream at the newest gelateria on the block, Coffee Company Luciano. 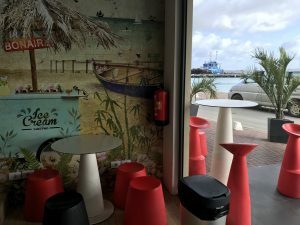 Luciano’s, (as the locals call it) located on the waterfront in downtown Kralendijk, opened it’s doors in June 2016. Luciano’s offers coffee drinks, gelato, bagel sandwiches, salads, other light lunch items as well as all sorts of fresh juices, cocktails made with locally grown mint, beer and wine. The locale fills the much needed niche of somewhere a little bit upscale to meet up with friends and stay awhile. We recommend it for cappuccino with a view! This is also a great spot to bring your computer and get some work done. Free wi-fi, comfortable chairs, air-conditioning and great lighting and view make it your own personal internet cafe or meeting spot. You may take it for granted with all the coffee shops back home (wherever you come from!) but until Luciano’s opened there was nothing like it on Bonaire. Luciano’s has one huge advantage too: It’s right on the water and the view even from inside, is magnificent. 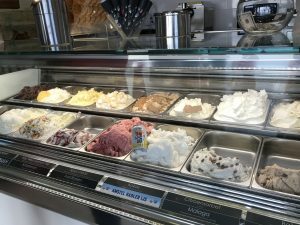 Step inside Luciano’s to find a soothing respite from the heat. The spacious, elegant and wonderfully air-conditioned interior lures you in and keeps you from getting up and leaving. A wonderful place to get out of the heat and enjoy conversation and company of friends. And even from indoors you get to enjoy the turquoise water. 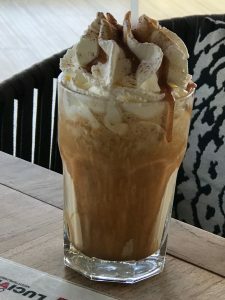 Coffee Company Luciano is located on a big, triangular piece of real estate in a location on the island that had mysteriously remained vacant ever since the old thatched hut restaurant “Salsa” closed it’s doors quite a few years ago. A large apartment complex with a museum and shops on the ground floor was put up in place of Salsa and also opened it’s doors around the same time. Coffee Company Luciano is in one of the shops attached to the apartment complex. The location is about as central and with as stunning a view as could be hoped for in downtown Kralendijk. The entire look, including Luciano brings a more modern and sleek vibe than the island has ever seen before. Luciano has a variety of seating options. Indoor, outdoor – on colorful plastic stools or in comfortable, elegant dining chairs. 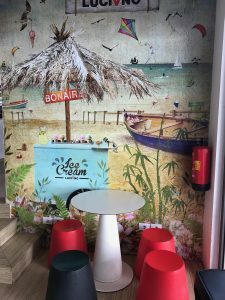 So many choices; frappuccino, cappuccino, fresh juice, wine, ice cream, indoors, outdoors, casual, elegant… Maybe you’ll have to come back a few times to try a little of everything! Italian Illy brand coffee is used to prepare all coffee drinks. 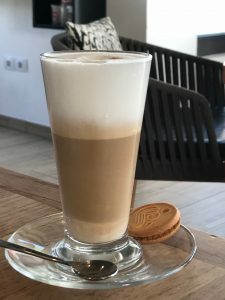 I don’t know if it’s the best cappuccino on Bonaire but it’s the best cappuccino with a view that I’ve found so far. Flag day on Bonaire takes place September 6th each year. In Papiamento, the local creole language, the day is called Dia di Boneiru – literally translating as Bonaire Day. 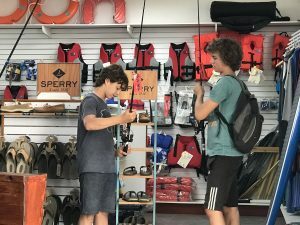 This is a national holiday with most stores and businesses closed: Dive shops and windsurf shops never close – don’t worry! Flag day festivities include a ceremonial raising of the flag in the morning, speeches, a party hosted in a different neighborhood each year with booths selling local food and drink. 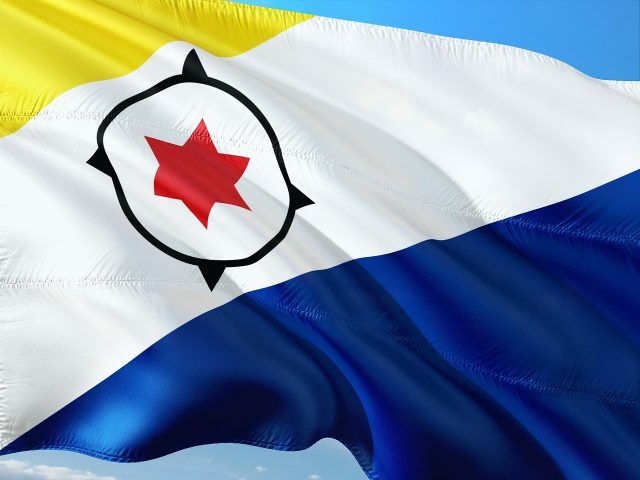 The six pointed red star on the Bonaire flag represents the original six villages of Bonaire: Rincon, Antriol, Nikiboko, North Salina, Playa (Kralendijk) and Tera Kora. All six villages today are thriving, bustling. neighborhoods and each year they take turns hosting Bonaire Flag day. Flag Day Bonaire is a day of national pride, celebration, music and fun. The Bonaire flag with it’s white, yellow, red and blue colors looks beautiful against the Caribbean Sea. The colors and design of the flag have special meaning. The blue is for the sea, of course! The yellow is – you guessed it, the sun! The white in-between sea and sun represents the sky. The red, white and blue honor the flag of the Kingdom of the Netherlands. Bonaire is considered a municipality of the Kingdom. The two other elements of the flag also have special meaning; the compass represents a population that comes from all over the world and the six pointed red star, the six villages. 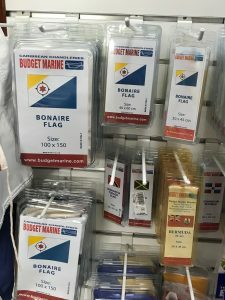 Pick up your own Bonaire flag at Budget Marine. They sell high quality flags in a range of sizes – the photo below shows what’s currently on offer. A flag of Bonaire makes a great souvenir and a way to show pride for your favorite Caribbean Island.